I want to watermark my MS Word 2007 document for my office use, Is it possible to do it? How to do it? How to crop pictures within a word document on windows based HP laptop? Re: Is it possible to add watermark in the MS 2007 word document? How to do it? STEP 1: Open the MS Word 2007 document which you want to watermark with text or picture. STEP 2 : Go to Page Layout tab - > Page Background. STEP 3: Select the option Watermark which is above the Page Color option. STEP 4: Select any one of the predefined watermarks or you can set your own by selecting Custom watermark to set the custom text watermark or picture watermark. -> Open the MS Word, click on the "Page Layout" tab, next click on "Watermark" Tab. -> Now you will see some default watermark options. -> You can also insert " Custom Watermark" , the option is given at lower bottom of available pictures. next click on "Watermark" Tab. 1.first open the ms word 2007.2 : Go to page layout tab.and then page baground3: Choose the option watermark.4: Choose any one of the watermark.its very easy.so do it.all the best. *- Open the MS Word document in which you wish to add the watermark. *-Click the Page Layout tab. *-In the Page Layout Background,click Watermark. *When you click on it,a dialog box with common Watermarks such as Urgent,confidential,draft etc will appear. *-Click on the Watermark required. This will set a faded image or text(whatever you have selected) set in your document background. It is possible and very easy to add Watermark to MS-Word Documents. 4) And at last if you want TEXT WATERMARK check the box named "Text watermark" and insert details to appear as watermark and select its properties of appearance. or, if you want PICTURE WATERMARK check the box named "Picture watermark" and select the picture you want as watermark and select its properties. 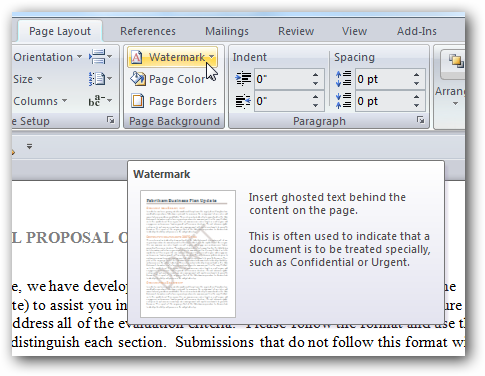 Off course, you can add watermark in the MS 2007 word document. Yes, you can add watermark in MS Office 2007 in your word document. For this you will have to Click on "Page Layout" Ribbon. Now, click on "Watermark". From here, you can insert Watermark to your document. now select the style which you want the watermark to be inserted. !_! Watermark comes as a in-built feature in MS word 2007 !_! !_! Click on Page Layout!_! !_! Now you can see Watermark,click on it !_! !_! Select the one that you want or custom it as per your wish !_! Open the Word, go to Page Layout and in the Page Background section click on Watermark. To add a custom image click on Custom Watermark as the bottom of the menu. > just open your document and goto page layout menu. > under that you have option called " watermark"
> from there you can add any watermark as per your requirement. Click on the " page layout Tab "
After this In the Page Background group click on the " WATER MARK TAB "
>> yes, it is possible and very easy to add watermark in your word document. >> just open your document and go to " page layout " option. >> under that you have option called watermark. >> just choose which type of watermark you need and then click ok.
>> you can put some setting also. yes my dear friend, you can add watermark to your word 2007 documents..
here is the procedure to do it. open the document to which you want to add watermark. at the top of the window you can see "Page Layout" tab. click on the water mark option. Now it is the time to select the watermark style or picture..
2.Click on page layout tab. 3.In the page background option.click on watermark option. 4.If you want to add any text you want then click on 'custom watermark option. 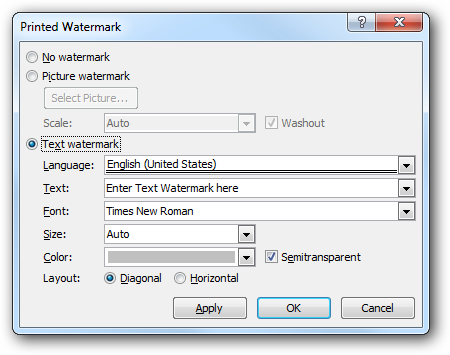 5.select text watermarks option & type the text in text box & give any format. 6.select the layout of the watermark as Diagonal or horizental. 7.click on apply & ok.
**************Scan your system with good quality of antivirus software. **************Antivirus will fix all the virus file and make your system workable. **************Now try to open Open Office again. **************After installation try to run open office. Go to page layout option. Go to page background option. Now you will see watermark on your Word 2007 page. The following is the procedure for solving the problem of add watermark in the MS 2007 word document. At first you have to go to MS 2007. Then tap on to the page layout option. Now press the page background option. There the option of 'watermark' is to be selected. After that the watermark is to be selected which you want according to your choice. Then the 'apply' option is to be tapped. Now press the OK option. 1. you open the MS word 2007 document as you want to water mark with the text ..
2.now you have need to go the page layout tab and go page background. 3. now you select the watermark which is above the page option . can set your own by select custom watermark to set the custom text or picture. 1.Firstly open your MS Word file. 2.Then you tap on the option 'Page Layout'. 3.And you will get many options there. 4.There you tap on the option 'Watermark'. 5.Then you select the watermark which you want. currently pick out the design that you need this watermark to get inserted. STEP 1: Open this MS Word 2007 document that you need to watermark along with text message and also picture. STEP 2 : Head over to Web site Format loss - > Web site Background. STEP 3: Simply select the method Watermark and that is over the Web site Shade option. STEP 4: Pick any of the predefined watermarks or you can fixed your individual by way of deciding upon Made to order watermark to create this custom text message watermark and also image watermark. open the word document . click on the tab "page layout "
click on the desired watermark and enter the Text . Now Click on it to Edit Information. Open Ms office word document..
Now you can add text if you want. Finally save changes with cntrl+S.